Cars drive themselves now. Strangely enough, this statement, which formerly would have seemed completely absurd, has already become a reality. If you don't believe me, just head to Mountain View, where Google tests their self-driving cars with regularity. Others are quickly following suit. In the market today, technology and automotive companies scramble to stay abreast of self-driving car development. Legislators face a similar struggle to keep up with the rapid developments in the field, and they face the challenge of drawing clear legal limits on a technology that has not yet officially come to market. Their drive to compete and remain relevant in a rapidly changing world has become especially clear in two distinct cases: Uber's push to hire the best robotics talent and legislator attempts to regulate the market. Uber wants to redefine transportation. They already have, earning a 50 billion dollar valuation and millions of customers. Still, their plan to move forward includes not only expansion into new, emerging markets, but also the eventual incorporation of self-driving cars. They made this apparent only weeks ago, when they poached a team of roboticists from Carnegie Mellon University (CMU) to work for their research and development teams. The pull of high salaries, stock options, equity, and recognition in a growing private company held significant allure for experts in academia. On a number of levels, the experts' desire to move from academia to the public sector is representative of what Thomas Hughes describes in his famous work, "Technological Momentum." Hughes initially constructed the term "technological momentum" as an alternative to technological determinism (the idea that technical forces determine social and structural changes) and social construction (the idea that social forces determine technical change). Hughes contends that "social development shapes and is shaped by technology," acknowledging the complex interplay between technology and society. How does this relate to Uber? Well, Hughes suggests that as a system or company grows, it becomes less and less shaped by its environment and instead begins to influence society itself. 20 years ago, if you wanted to push the frontiers of robotics, you had primarily abstract academic options to consider. But now that the field is booming, a faculty member or grad student with an ambitious idea has to ask questions: Where’s the best place to pursue my research — at a university, or in the corporate R.& D. lab at a place like Uber? What type of engineering work is so far out, so hard and so unsolved that it can only be done at a university? Uber has expanded to the point that it offers enough compelling opportunities to draw experts away from formerly leading opportunities. Within the framework of Thomas Hughes, Uber has gained significant technological momentum on the road to leading the self-driving revolution. Regardless of the broader market for self-driving cars, California currently provides a testing ground for the technology. Google tests its cars in mountain view, Uber is based in San Francisco, and Tesla is headquartered within the state. California needed comprehensive regulation, and pretty soon, other states will too. Unfortunately, law is notoriously slow to catch up with technology. As Marchant notes in "The Growing Gap," law tends to struggle with legislative, regulatory, and judicial issues. Much existing legislation relies on a static world view, limiting its ability to adjust to a rapidly changing market. In the legislation process, gridlock can lead to inaction, and political priorities do not always match the needs of the world. As a result, technologies such as stem cells, drones, and others have developed with limited regulation. 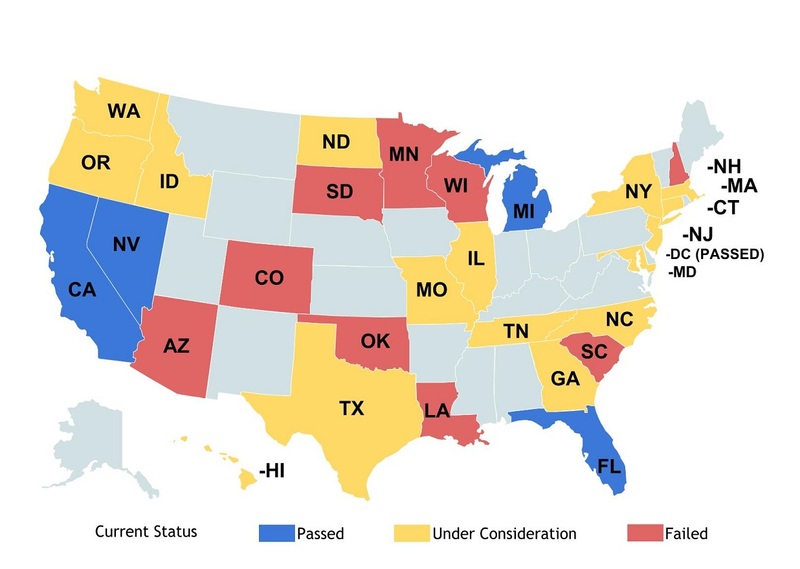 The following map (courtesy of Gabriel Wiener and Bryant Walker Smith) demonstrates the current regulatory status of self driving cars across states. As demonstrated, California is one of the few states to have taken comprehensive action on the issue of self driving cars. In California, self-driving cars are currently legal, but the legislature faces further challenges in the future. Can cars drive without a human operator(as would be the case with Uber)? Who is liable in the case of an accident? In the absence of law, we can look to other standards for the regulation of the technology. We can apply Lessig's famous four modalities: law, social norms, market, and code/structural regulations. The interpretation of these four governing factors has grown more complex, most notably with Raab and de Hert's recognition of their interdependence. However, markets, social norms, and structural regulation all have a role to play, distinct from law itself. Markets are clearly a regulating factor. If the market for self driving cars grows further, it will serve as an impetus for more actors to get involved. If people begin to feel comfortable with self-driving cars, they will create a higher demand for the technology, pushing companies to send them on the road faster. Social norms have a similar role to play. If self driving cars are perceived as unsafe or unfashionable, it may reduce demand. On the other hand, if there somehow developed a perception of driving oneself as "unsafe," (given that self driving cars almost never get in accidents) it could push people to adopt the technology quicker (thus requiring more formal laws). Finally, structural concerns have a significant role to play. As Harry Surden notes in "Structural Rights to Privacy," each modality comes at a distinct "cost." In the case of structural regulation, Surden focuses on latent structural concerns, which relate to the "secondary costs arising from the current state of the world." These are things that are essentially too difficult to do in the world today and therefore are, by default, not regulated. For example, we don't have laws to regulate consumer rockets because they can't exist due to costs. The latent structural costs with self-driving cars could relate to the inaffordability of cars or the simple fact that no company has a car that is ready for market. As a result, law does not necessarily need to step in and govern consumer self-driving cars. Currently, the markets, social norms, and structural mechanisms play a large role in regulating the market. However, there is sufficient technological momentum behind companies such as Google and Uber to make the sale and use of self-driving cars a foregone conclusion. By acting now, laws can effectively "anticipate" this growth and take action to regulate the emerging technology. The Fair Automation Practice Principles (FAPPs) will likely not be enough unless properly incorporated into the next generation of legislation. Uber and Google have no plans to stop. Neither does Tesla, Honda, Mercedes, or any of the other companies pursuing autonomous vehicles. If we're not careful, that car next to us in traffic three years from now may not have a driver, and that is definitely scarier if the law doesn't have anything to say about it.